… Okay, so, it actually is quite possible, thanks to Yun Lai who has written blessed-vue, a Vue runtime for blessed. Blessed is a node-based curses/ncurses-style library providing GUI-style terminal interface capabilities for your apps. We won’t go into all the details on blessed and how it works here, but it would be a good idea to take a look at their (very detailed) README for more information on that. What we’re here to do is write a terminal app with Vue, so let’s get started. We’ll need a few dependencies for the app we’re writing, a few for the build process, and a webpack configuration file (just for vue-loader). … and our dev dependency list. And the webpack config file. Finally, just for convenience, I’ll throw the npm build scripts here, though they’re not really complicated. npm run dev will recompile the program every time a file changes, while npm run build will only build it once. Now, we can actually write the thing. 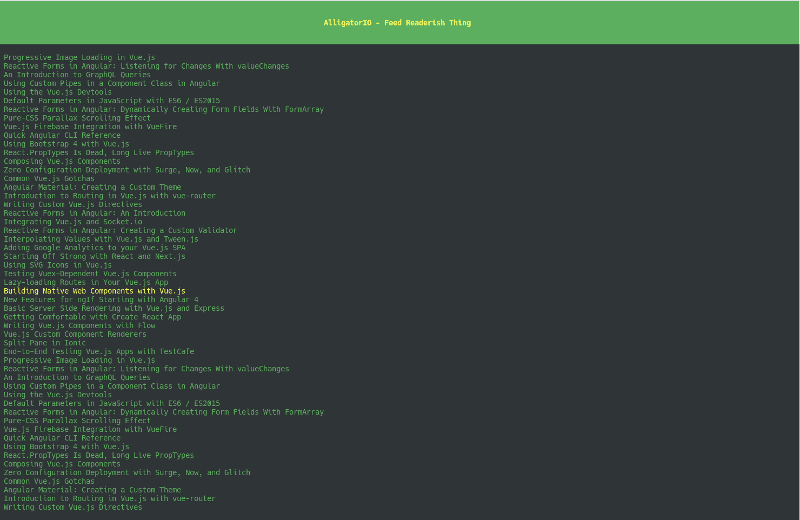 The goal here is to create a somewhat nice-looking terminal program to pull the list of most recent articles from Alligator.io’s RSS feed and display it in the terminal, allowing you to select an article title and have it open in your browser. Let’s start out with the main bootstrap file. There are a few important differences from a normal Vue program, namely the import of blessed-vue instead of vue and the use of a fake root element since there’s no DOM in the terminal. // Make sure to import from 'blessed-vue' instead of 'vue'! // Mount to the fake element. <!-- Every blessed app needs a root "screen" element. into account when positioning things. <!-- You'll probably notice that width and height need to be specified explicitly here. This is because blessed positioning is more like CSS absolute positioning than anything else. Also, blessed has no CSS support. Styles compile down into JS objects. content="AlligatorIO - Feed Readerish Thing"
style="bg: black; fg: #3FA767; bold: true;"
<!-- A list that displays a scrollable and selectable list of text. In this case, the feed titles. // A request library. You could use node's HTTP instead, but I'm lazy. // A tiny module to open links in the default browser. // be a pain to do in the template. // Produces a list of article titles from the feed object. // Opens the selected list item in a browser. // Close the program when CTRL+C is pressed. Once all the code is in place, run npm run dev to start webpack. Then, use node dist/build.js to start the program. Easy-peasy! And that’s all! You now (hopefully) have a fully functional Alligator.io feed list reader thingy running in your terminal, written with Vue.js!